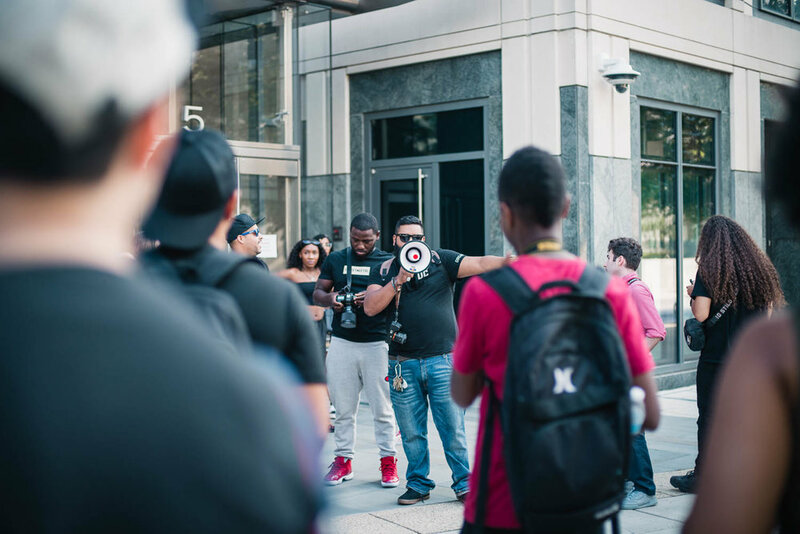 Once a month, the collective over at StreetMeetDC puts together an event around the DMV area to provide an opportunity for local models to work with photographers of all skill sets. The event brings out some of the city’s brightest talent and encourages creativity and networking. Their mission rang true for my first time participating. For this particular event, the group met just outside of the NoMa-Gallaudet station in Near Northeast DC and used the Metropolitan Branch Trail as inspiration. Although scheduled to begin at 5pm, the organizers let people mingle until 5:30pm, as traveling across the city can be overwhelming. The group neared 50 people from my estimation, at least at the start of the event. Throughout the day, participants came and left all on their own schedule, which made the day more relaxed. The trail itself offered an interesting backdrop for diverse pictures. Near the station, photographers had the opportunity to photograph their subjects standing on the bridge overlooking Florida Ave NE. As the group progressed, though, the bright graffiti wall pushed creatives to play with color and form in a new way. It's hard to say which was my favorite, though. When it comes to the event in general, I have to say there are positives and negatives, but I don't think that's any fault of the organizers. Getting together such a large group of people proves difficult to manage as the group disperses. There wasn't anything out of control from what I saw, but there were plenty of photographers and models unaware of where they were standing and how that impacted another person's shot. The same critique can extend through the event and to each of the participants, though. There were plenty of people who knew what they were doing, but they were oftentimes sidelined by the unrestricted excitement from less experienced photographers. More than once, I would spend the time to pose a model, only to have another photographer jump in front of my camera to capture the same scene. I decided to leave a scene out of frustration at one point. Despite this, I thought the event was fun and engaging. I took some photos that I thoroughly enjoyed and connected with some people that I would like to work with in the future. Check out some of my favorite shots below, and don't forget to check out each of the model's linked Instagram accounts.